The GNSC invites you to our 6th annual Year End Party! The event will take place at College Heights Secondary School on Thursday December 13th 2018 from 6:30pm – 9:00 pm. 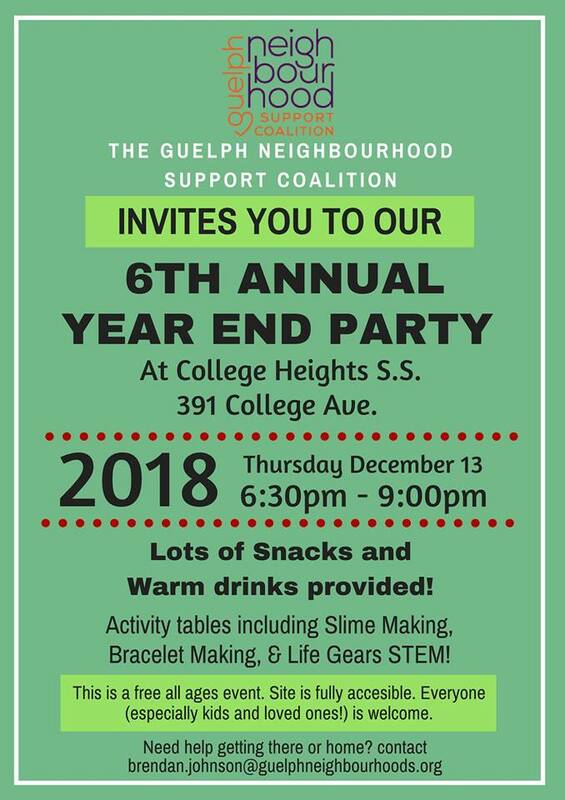 There will be lots of snacks and warm drinks as well as activity tables for making slime and bracelets. Life Gears will also be there with a STEM table. This event is free and for all ages. The event site is fully accessible and everyone (especially kids and loves ones!) is welcome. If you need help getting to the event or getting home afterwards, please contact brendan.johnson@guelphneighbourhoods.org.